At the end of this post, please share your favorite place to shop for discount home decor. In honor of St. Patties Day, I thought it would be fun to share a fabulous green find. Recently, I posted a sunroom makeover project inspired by the Westin Hotel (click here if you missed it). I received a lot of inquiries about the green lamps used in the space. Our goal with Beth's makeover was to balance her project allowance using a combination of quality pieces, custom drapery and discount home store accessories. We spent the bulk of the budget on critical design elements and saved where we could save without sacrificing the design. 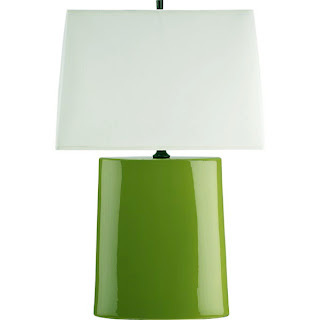 The Crate and Barrel lamp was gorgeous, however it was a bit of an investment. Especially considering we needed two. In order to keep from going over budget, I went in search of an alternative. I paired it with a large oversized square lamp shade (also from Target) to achieve a similar look as the high end version. Substituting budget friendly Target lamps for the high end Crate and Barrel lamp freed up more of the budget for a fabulous rug and gorgeous custom drapes. The give and take between investment pieces and discount finds resulted in a high style, yet practical space. If you would like more details on Beth's makeover, please click here. Where is your favorite place to shop for discount home decor? In Detroit, we are all about HomeGoods, but please tell us what your "go-to" place is. I have used Meijer for a few decorational things, and haven even noticed you do to!!! Wow! You'll never think of the Crate and Barrel version again. The ones you picked are perfect. We LOVE our same green lamps! Ours are in our DIY bookcases my husband built: http://www.lifeinyellow.com/2012/06/arrange-and-rearrange/. Love reading your blog! Absolutely HomeGoods. I also like Ikea, but thankfully, they are not too close! TJ Max, my favorite!!! I also like Target, Hobby Lobby, Kohls and recently found some great finds at Michaels and Dollar General (who would have thought? ), they have a line of home decor of the black, white and turquoise color family. It looks incredible! I am still recovering from a broken ankle back in July. So most of my shopping is online. When I lived in TX, I loved Marshalls. In addition to the ones already listed, I'll add Ross and Stein Mart.